The first gift I'm buying this year. mothers are burying their babies. I know what it feels like to bury a child. I would do anything to prevent a mother feeling that pain. If I could have prevented Joy's death I would have. If you could have prevented her death, you would have. But we do have the power to save lives. year than all forms of violence, including war. in Africa with clean water for ten years. Today I do not care about anything else. Today I am buying water. Because I can do something. I can save a mother from the agony of losing her precious child. $10 is hardly a sacrifice for me. by far the best money that I will spend this Christmas season. Today is about saving lives. Today is about something bigger than ourselves. 100% percent of your donation will buy water for Christmas. I'm so glad you are doing this! What an awesome idea! We have a missionary friend (Living Water Ministries) in Guatemala who digs wells there. Not only does he help provide entire villages with clean water and medical needs, he and his team also share the love of Christ. The Chubby Dove donates a percentage of all sales to this ministry. My husband and I purchased a "well form" which is a mold used in making new wells for villages. We take for granted that we have fresh clean water. People in these areas have to drink the same water that they bathe in and that's just not right. Thank you for doing this. 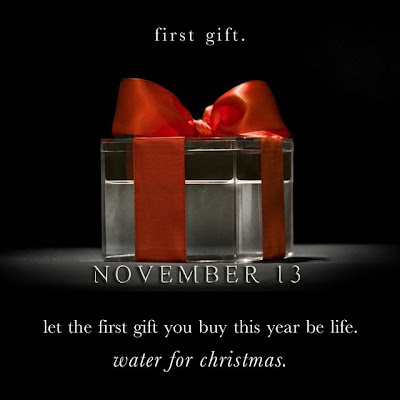 I hope alot of people will GO BUY WATER! Wow, this was a great way to start the morning. I made my Paypal donation and am off to Facebook this to my friends. Have a blessed and bright day everyone! I look at this post and wonder how many people's lives YOU will change because you chose to share this. People you don't know, people who don't know you. People without internet and TV. People fighting to survive. I know that you have COUNTLESS followers and even if just a handful of them take the time to click on over and donate, people will live. I just came from the website and made my donation. But not for the scarf...because this year more than ever it is important to me to teach my kids and remind myself the TRUE meaning of Christmas. It isn't about getting, but about giving...especially to those less fortunate than us. This is such a small way to help those who don't even have the basics for survival. Thanks for sharing...you are helping more people than you even know. What a great first Christmas Present purchase! Just blogged about it - used some of your words and pictures since you said it so much better then I could...hope this is ok. Thanks again for doing this. My donation has been made, plan on doing more. Thanks for spreading the word. AWESOME!!! thanks for being a part of this!!! I just went and bought water. It was simple. Thanks for encouraging others to give something so important! what a perfect way to start the Christmas spirit. I'm making it my Facebook status today. And it feels so good to help others. I made my donation! A gift I just know Jesus would love to have at His birthday party!! I also contacted Water4Christmas.etsy.com to see about a blog post to help promote the cause even more! Africa is very near to my heart so thank you Julie for this post! What a great cause! I just donated $20. It's so sad that we waste so much water everyday, when there are people out there that don't have ANY clean water. I'm totally stealing some of your post and pictures for my blog. Thanks!! I made my donation and put a banner on my sidebar. Its the least I can do. I did a blog entry too. This is a beautiful idea! I will buy some water too and spread the word. I just wrote about this on facebook. 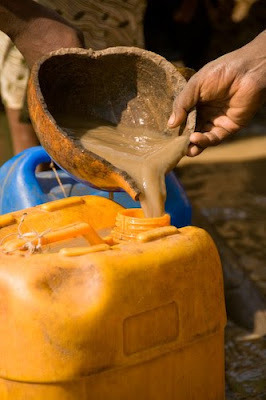 We think we are broke all the time, but not having the resources or money to give my baby clean water...$10 is nothing. Just blogged about it on our crafty blog as well as our personal family blog! May families be flooded with water this Christmas season! Thank you for letting us know this way to share Christ's love. What a great post. We have been contributing through our church through a program called Water is Basic. It helps equip the Sudanese people with drilling equipment and manpower to dig their own wells for their villages. We just recently hit 100 this month! Yea! 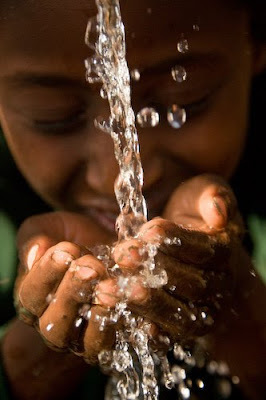 for clean water for all! love this--thanks for posting cause I didn't know about it. I will blog about it and post on facebook. Ten dollars. I can do that. And really enjoy my water today. I donated - very easy to do! Great post! Our church started something similar a few years ago called Advent Conspiracy. I wouldn't have know about this if it weren't for you. I, too, have made my donation and hope this will help make a difference. I'll facebook it too. I'm donating and I'm urging all of my fb friends to do the same. I'm going to let my small group know about this later today. blogged about it last night & donated at midnight & tweeted it. love your heart for this. I've read a few blogs this morning that have posted about Water, but the way you wrote your post is insanely moving. Just thought you should know. Off to facebook to spread the word. Julie, you have such a heart for God! Just donated and will blog about it later. Thank you for putting this out there, Julie! This is why I love you and your blog. You continuously help others in whatever way you can. You don't think about yourself but how to help others. I am off to donate. Thank you. Thank you for posting this. I went and donated right away and posted it to my facebook page in the hope that others will donate as well. Cool Cool Cool.... our church did this last year and we decided to do it this year as a family.... the girls will get their Santa gifts but the rest of what we would have spent is going there.... we are so excited!!!! and i have a wonderful feeling so many more will because of the great, thoughtful, caring blogging world. its amazing what can happen with just a post. donated $20 yesterday...it feels good to do something (although small) at least! I just got home from a weeks quilt camp. I have you on my blog list and am slowing ( while doing the wash, cleaning house....you know the routine) catching up with blog land. Your gift is one that I am buying too. We all need to be reminded of OUR blessings and those that are not so fortunate. It will make your heart beat a bit faster to see that there is an uprising. A movement. To end extreme poverty. I'm late in the game, but I donated also and put a link up in Facebook. So wonderful. I am just now reading this post. And crying. That was my birthday. The day I was being selfish and letting my family spoil me, could have been the day I helped save a life. But I am reading this now. Better late than never.